Online shopping is killing traditional shopping venues like Toys R Us, Sears, Kmart, JCPenny and others. That’s what we’re told anyway. And it seems that the proof is in the pudding as online holiday shopping sales for 2018 increased around 16-percent year-over-year and Black Friday Cyber Monday year-over-year revenue increased by more than 22-percent. More people are shopping online, and more money is being made by businesses that have a strong online presence.Still, despite this growth according to the National Retail Federation (NRF) and Forrester’s State of Retailing Online study consumers are still visiting retail outlets in significant numbers. In other words, digital shopping alone is not killing physical retail. Though making online purchases is convenient, the study revealed consumers expect digital and traditional retailing to be intertwined.Furthermore, though grocery stores like Kroger are less impacted by online shopping than department stores, the grocery industry is still affected. Most large grocery stores offer an online experience where shoppers can place orders digitally, and as with other retailers, are either delivered to the consumer or picked up by them at the store. Microsoft and Kroger have partnered to take advantage of what the data shows is a consumer’s desire for the benefits of both a digital and physical shopping experience. Companies that strategically combine both find success in the modern marketplace where others fail. The advent of the automobile presented a challenge to the stagecoach (and its makers), which at the time was the established mode of transportation. Creating a better, prettier and faster stagecoach was not the answer to this challenge. The introduction of a new mode of transportation and new technology presented a need and opportunity for companies to think about how they would take advantage of this shift. The advent and increase in online shopping require companies to think about how they can take advantage of the web, mobile devices, PCs, apps and the traditional shopping experience to meet consumer needs. And because consumers are still visiting physical stores, an omnichannel approach is necessary if businesses are to succeed in the modern market. “Omnichannel” is when a company provides customers with multiple access points to its business. This includes shopping online via a PC at home, via a mobile app on the go or in a physical store. It can even include a combination of the digital and physical where a consumer in a physical store uses technology to order a product for delivery. There are pros and cons to physical and digital shopping experiences. Some advantages of visiting a brick and mortar store include the ability to physically see and touch a product, the immediacy of having a product at the time of purchase, direct customer service and the ability to return a product in person. Some advantages of shopping online are the convenience of not leaving home, the potential for better prices and deals, able to compare and review up to date product data, a personalized shopping experience where ads, suggestions, and deals that are reflective of past activity. Microsoft’s and Kroger’s pilot program that provides RaaS (Retail as a Service) is geared toward harmonizing a customers’ digital and physical shopping experiences. 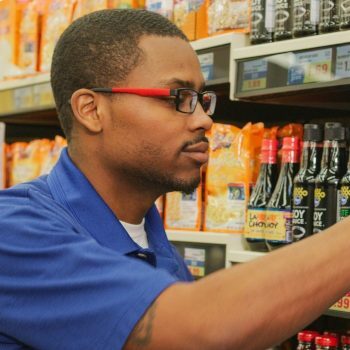 To that end, the Microsoft and Kroger partnership leverages Microsoft’s Azure cloud platform and artificial intelligence in combination with Kroger’s expertise as the world’s largest grocery chain. The goal is to utilize technology and data-driven insights to provide shoppers with a smooth and personalized experience that reflects the advantages of both traditional and digital shopping experiences. To bring the advantages of the digital shopping experience to the physical Kroger and Microsoft are using the cloud, a smartphone app, EDGE Shelf (Enhanced Display for Grocery Environment) technology, and a Scan, Bag, Go device. The digital experience begins with a smartphone where a shopper creates their shopping list – not unlike how they would if committing to a digital-only experience. The digital and physical cross-over, however, when the shopper arrives at the store and picks up a Scan, Bag and Go device that aligns with the shopping list in the app and provides a guided and expedited shopping experience. The shopper is also assigned a digital avatar that digitally enhances their physical shopping experience by flashing on the digital EDGE display when the shopper arrives near the product on their list. Like a digital-only experience, the EDGE display will also serve up personalized ads and offers and display up to date content about a product. The EDGE displays also provide data that help employees keep inventory stocked and a pick-to-light feature helps associates quickly find items for curbside delivery. Kroger and Microsoft are embarking on a journey that creates a symbiosis between the inescapable digital shopping reality which we are delving deeper into and the traditional shopping experience that we are rooted in. Traditionally, businesses that overcommit to a single experience, creating an imbalance, have found it difficult or even impossible to reap long-term success in the modern marketplace. As technology evolves, businesses have to evolve their modalities to match. Even online powerhouse Amazon has acknowledged the need for a physical presence. Physical stores that provide traditional shopping experiences such as Amazon’s Whole Foods, where customers can pick up items, or quickly receive fresh produce locally via delivery. As we move into this future, I can’t help but visualize how augmented (AR) and virtual reality (VR) with devices like future iterations of HoloLens might make virtual and augmented visits to a store possible. Where customers will walk through a virtual store, select digital representations of actual products that are paid for by a cloud-linked account and delivered to one’s home. Or where an AR experience guides a shopper through the physical store and displays an overlay of personalized product information, offers, and ads over products. Wherever we’re headed, Kroger and Microsoft are creating a foundation where our digital and physical shopping experiences are intricately intertwined.